Greek “Spanakopita” (spinach pie), pronounced (spa-nah- KOH -pee-taa), is possibly the most popular Greek pie, made with spinach, aromatic herbs and feta cheese. This article is your guide to make a perfect Greek spanakopita! Spanakopita is the most perfect snack but it can also be served as a main dish or if served in a buffet it may yield twice as many pieces. The main ingredients for spanakopita are: spinach, onion and fresh green onions, herbs, eggs, feta, olive oil, salt and pepper. What herbs and vegetables must I use? Eating only spinach makes its taste very boring, so the addition of aromatic herbs makes it much tastier. The herbs used are primarily dill and green onion but a combination of herbs, such as parsley or kafkalithres and myronia, which are very aromatic, add an amazing taste to Greek spanakopita are used in Greece during autumn/winter, when they grow. However, if these herbs cannot be found, add more dill and parsley, not coriander (cilantro), or wild fennel fronds but we NEVER add garlic to a spanakopita! Some people also add some mint, but personally, I don’t like it in spanakopita. Spinach has a lot of water in it, so in order to make spanakopita, all the water must first be removed from the spinach. There are two ways to do this: Wash the fresh spinach, removing the stems or any damaged leaves and drain. Season with salt and after half an hour squeeze it with your hands to remove all the water. Frozen spinach can also be used. Thaw the frozen spinach and then squeeze out the water. You do not need to add any salt to do this. *Alternatively, when fresh spinach is still wet put it in a big pot, without any additional water, and bring to a soft boil for about 5 minutes, mixing regularly until it wilts. It will become soft and its volume will be reduced. Let it cool and squeeze out the water. Instead of using all the ingredients raw, you can sauté the onion and wilt the spinach in the frying pan. Make sure to cook it until all the moisture evaporates. You can substitute part of the onion with some leek. Other greens, such as various wild greens and stinging nettles, or endives, kale, silveerbeet, chard etc. are also used combined with spinach, but we call this a “hortopita” which means (mixed greens pie). Can I add other Cheese except for feta? Feta is the most common Greek cheese used in a spanakopita. However, feta is preserved in brine, which sometimes makes it very salty. If you want a milder taste, you can substitute a part of feta with some anthotyros (a whey cheese, similar to ricotta), which is not salty or even add some cottage cheese or Greek yoghurt. Also substituting part of feta with graviera or halloumi, gives a much more delicious taste. 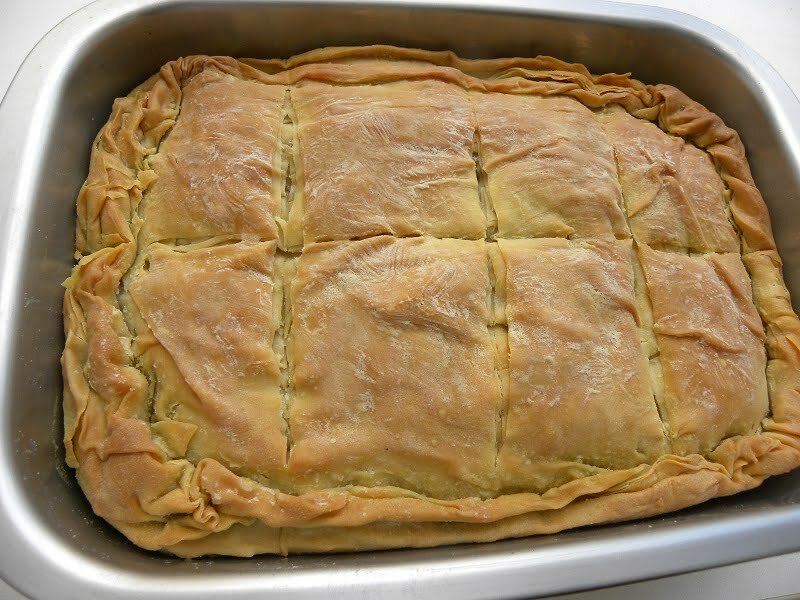 Spanakotyropita, is a combination of Spanakopita and Tyropita. Adding more cheese than usual to a spanakopita is called Spanakotyropita to indicate that there is more cheese than spinach. The type and amount of cheese to be used varies depending on how “cheesy” you want it to be! What type of Phyllo can I use? Homemade dough for pastries, is an unleavened dough, made with flour, water, vinegar and olive oil (other types of fat can also be added). This can be made as thin as you like and it is used to make pastries and pies. Homemade Horiatiko phyllo (provençal pastry). This one is thicker and has an egg in the dough. Homemade Dough with butter. It is a simplified type of puff pastry. Homemade Kourou Phyllo, is made with butter and yoghurt. Store bought phyllo, such as horiatiko, phyllo kroustas (the one we use to make pastries such as baklavas or galaktoboureko), sfogliata (puff pastry), or kourou are also used. For this Spanakopita I am using the store bought village type of phyllo, called “horiatiko” which is thicker than the usual ones. There are six sheets of phyllos in a package, which are sprinkled with flour, in order to avoid each phyllo from sticking to each other. You do not need to brush off the flour but make sure that it is wet well with olive oil, so that no flour will be left on the dough. You can add half of them as the bottom layer and three above. I usually add four sheets as the bottom layer and the other two on top as the overhanging pieces are cut and added on top to form two more layers. This phyllo is soft, so the edges are twisted and then joined to enclose the filling. This is called “kothros, κόθρος” in Greek (I will call it crust, as I don’t know the name in English). We make this in order to enclose the filling but also for ornamental purposes. However, those crunchy edges of the pie are so delicious, that many years ago, when all the five of us lived together, we used to fight over who would get a corner! Regular phyllo, called “phyllo kroustas – φύλλο κρούστας”, in Greek, is a bit trickier. You can still make a “kothros” while it is fresh and soft but it dries out very easily and it crumbles. In order to achieve this, you need to wet it well with olive oil and then twist it. However, it is perfectly fine if you do not make the twisted edge. For this type of phyllo you add half the package as the bottom layer and half on top. Don’t forget that you should brush each phyllo generously with olive oil. Can I make a Vegan Spanakopita? Definitely! We, Greeks have a lot of fasting days, so our Lenten Recipes are without meat or animal derived products (except for honey). To make spanakopita “nistisimi” or vegan, just leave out the cheese and eggs. No substitutes are necessary. A little bit more olive oil (about ¼ cup) can be added for more taste. If you want to add tofu or other vegan cheese, its up to you but I prefer it without any. I have three different kinds of vegan Spanakopita on the blog: The classic Greek Lenten Spanakopita, a second Spanakopita Nistisimi (Lenten) which is a twist I made from one I remember from Cyprus and one I made with Spinach and Black Giant Beans. In Greece, we usually use olive oil. However, you can use vegetable oil, margarine or clarified butter. We are not stingy when it comes to using olive oil. The phyllo must be generously wet, so that it becomes crunchy and tasty! What is the Perfect Height for a Pie? The word “pita” in Greek means flat, so from this word, it also means the flat bread or a pie. To indicate what kind of pie, the suffix pita is added after the name of the main ingredient, i.e. SPANAKO (spinach) -pita, TYRO (cheese) -pita, HORTO (greens) -pita, PRASSO (leeks) -pita GALATO (milk) pita, etc. In the villages they used to have these huge round, shallow baking tins called “sini – plural sinia” which used to be made of copper, much more shallow than ordinary baking tins, not more than 3 – 4 cm high (1.5 inches) and decorated with beautiful patters. This is where they would make their pies. The word “sini” is is a word which is tending to disappear from the Greek vocabulary as sinia have been replaced by tapsi(a). In Cyprus however, whose official language is Greek, a dialect is spoken with ancient Greek roots and many of the words we use in our everyday conversation have similar words. In Cyprus we do not say tapsi we say sini. Of course, these type of sinia are still used but of course they are neither made of copper nor elaborately decorated. You can still make it in a tart pan or a regular baking tin but it should not be thicker than 2 – 3 cm (1 inch). As I said, my family prefers a pie with more crust than spinach so I usually make my own phyllo and make a Spanakopita Strifti, which means twisted, from its shape, so each piece you get is like getting a nice crunchy phyllo like those we always try to find in one of the corners of the baking tin. If you want to make the dough from scratch (see step by step instructions here) and leave it to rest for at least half an hour. See how to roll out phyllo using a dowel or making it using the pasta machine. Clean, wash and dry all the herbs. Blanch the spinach (no water added *see note above) for 2 – 3 minutes to wilt and let it cool. Squeeze out the water from the spinach and then chop it into smaller pieces. Crumble the (cheese feta and anthotyros) or grated graviera. Put the spinach in a large bowl and add the olive oil, the onions and herbs, as well as the eggs, cheese and spices and mix well. Grease a 32 x 23 cm /12.5 x 9 inches baking tin with olive oil. The remaining olive oil is used to brush the phyllos. Brush one phyllo at a time and put it in the baking tin, leaving about 8 – 10 cm / 3 – 4 inches overhanging. Continue with three more phyllo, so that all sides of the pan are covered. Add the filling and spread it to go everywhere. Fold half of the overhanging phyllos, towards the centre, brushing them with olive oil. Brush the fifth sheet of phyllo with olive oil and fold it in the middle. Place it on top. Trim excess pastry and put the pieces on top of the fifth phyllo. Finally brush, fold and add the sixth one on top. Take the bottom and top edges and crimp them, so as to enclose the filling. Using both hands on the inside of the edge of the baking tin, fold using your thumb and index fingers to join the edges. Brush with more olive oil around the edges. With a sharp knife, gently score into square (or diamond) patterns, making sure not to cut right through. Reduce heat to 180° C (350° F) and bake for about 30 – 45 minutes, or until golden brown. Cut the pieces where you have previously scored the pieces, so that the steam will escape and not make the phyllo soggy. Greek "Spanakopita” (spinach pie), pronounced (spa-nah- KOH -pee-taa), is possibly the most popular Greek pie, made with spinach, aromatic herbs and feta cheese. This article is your guide to make a perfect Greek spanakopita! Blanch the spinach (no water added *see note above) for 2 - 3 minutes to wilt and let it cool. Brush one phyllo at a time and put it in the baking tin, leaving about 8 - 10 cm / 3 - 4 inches overhanging. Continue with three more phyllo, so that all sides of the pan are covered. Reduce heat to 180° C (350° F) and bake for about 30 - 45 minutes, or until golden brown.